Jamie Pottern is the Farm Conservation Program Manager at Mount Grace Land Conservation Trust. She protects working farms across north-central and western Massachusetts, focusing on innovative mechanisms that keep farms available for farmers. 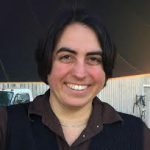 Jamie coordinates the Greater Quabbin Food Alliance, a regional network fostering cross-sector connections to strengthen and rebuild local food systems. She holds a master's degree in Sustainable Landscape Planning and Design from the Conway School of Landscape Design and a bachelor's from Brandeis University.